I got excited about IPAs because of the flavors that hops bring to a brew. More recently I started to notice the difference freshness makes and how quickly the hop flavors fade. Thanks in part to Stone releasing their Enjoy By IPA series, which expects people to drink the beer within a month of release, general beer drinkers are starting to understand how important freshness is. Follow the Enjoy By link for Stone’s explanation of this. But simply having bottles at home that are fresh is only half the battle. You also have to store those beers properly to avoid losing those hop flavors. I am not going to go on about specific temperatures but I will simply keep things as simple as possible. Refrigerating your IPAs once you get them home in a bottle (like I know you would with a growler) ensures that your beer tastes as good as it did when you brought it home when you open it the following week. This is only half of the battle though. The other part is making sure that you purchase your beers from a shop that stores their beers properly, or go direct to the source. There are a lot of steps a beer takes from when it leaves the brewery until you find it at your local shop. Thankfully a lot of the big breweries in San Diego that bottle their beers distribute through Stone. Stone takes the necessary steps to ensure that until they drop the beer off at the next step it is properly refrigerated. Read about how Stone explains it on their distribution site. However, you don’t always know how properly the beer was stored by a particular company before putting it on the shelves. Sometimes finding beers from certain breweries in a shop is a good indication that the shop stores the beers properly. Russian River is known for being very strict about how their beers are kept both during shipping and once on display. Alpine is also strict so if you can find beer from either brewery at a bottle shop you know that they store the beers properly. Alpine has a list of places where you can find their beers on their website. One thing to look for is coolers that don’t have bright fluorescent lights on the beers. More recently though, I’ve found that it is worth going direct to any local brewery and buying the beer from the source. That way you are guaranteed that the beer you are buying is as fresh as possible and stored properly. Stone has a few smaller tasting rooms where you can buy bottles without trying to park at one of their big restaurants. But for beers from out of state or out of county proper storage makes all the difference and helps ensure that you enjoy the beers as they were meant to be tasted. In summary, make sure that you keep your IPAs away from sunlight and/or fluorescent lights and that you store them in a cool place. You should notice the difference right away. Because some of the things I discuss here is based on discussions I had on Facebook with fellow beer friends, if something here is inaccurate, please let me know in the comments. If you think I am making a big deal about something that is not very important, also let me know. If you are interested in some of the science behind how light affects beer, check out this article from Mark Dredge on Pencil and Spoon as well as a more detailed article from someone in The Bruery’s lab. 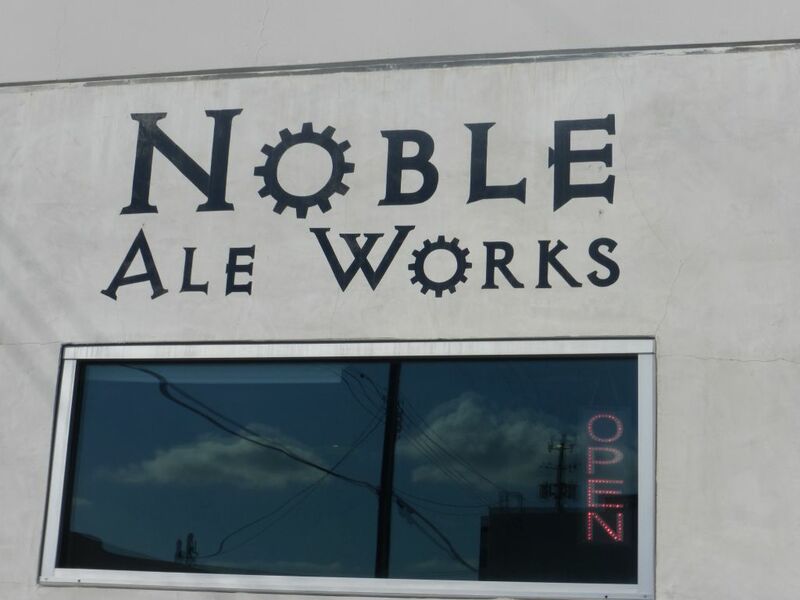 A few miles from The Bruery is Noble Ale Works, a brewery that knows how to make a fantastic IPA. My first introduction to the brewery was a double IPA that I tried down in San Diego. I immediately took notice and wanted to stop by for a visit. 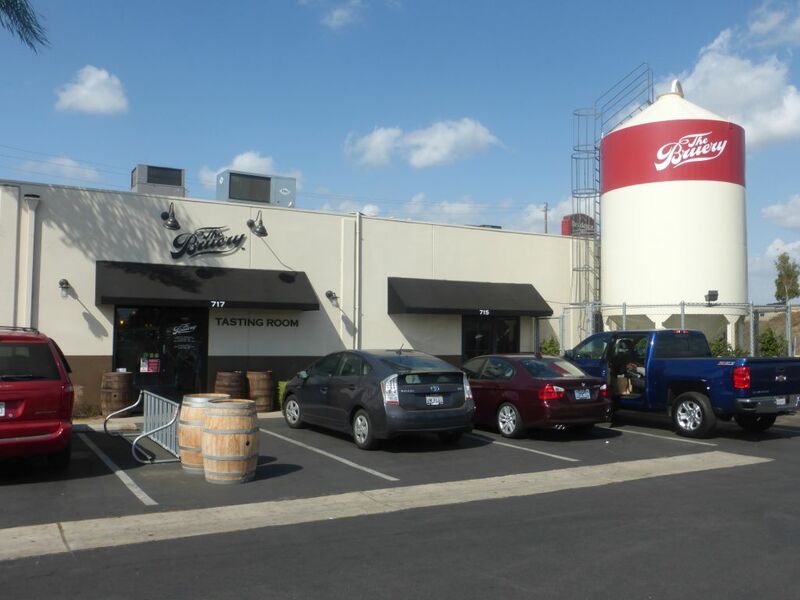 I didn’t make it to the brewery itself until a few weeks ago when I stopped by both The Bruery and Noble Ale Works on September 27, 2014 on my way home from LA. I tried five beers while there, Rosalita (a hibiscus infused pilsner), pale ale, Big Whig IPA, a coffee milk stout, and man’s milk. The Rosalita was not particularly impressive. There was very little hibiscus flavor and if it wasn’t pink in color you probably wouldn’t even know it was flavored. I didn’t finish this taster. The pale ale was quite impressive with a nice juicy flavor that set it apart from most piney pale ales out there. The Big Whig IPA is a powerful IPA that really shows that Noble understands the West Coast style of IPA. It has a lot of citrus flavor and a bit of resinous flavor as well to balance it out. I had this beer on tap down in Mexico pretty recently as well and every time it hits the spot. The coffee milk stout was a bit sweet and strangely light colored. It had plenty of iced coffee flavor to go nicely with the sweetness. The Man’s Milk was pretty similar with a little more syrupy sweetness going on and a lot more caramel in the flavor. Because I had already been to The Bruery and was going to dinner when I got back to San Diego I didn’t try the Galaxy Showers, a seasonal double iPA using just galaxy hops. There was another seasonal double IPA called Chinook Showers as well but I didn’t try that one either. 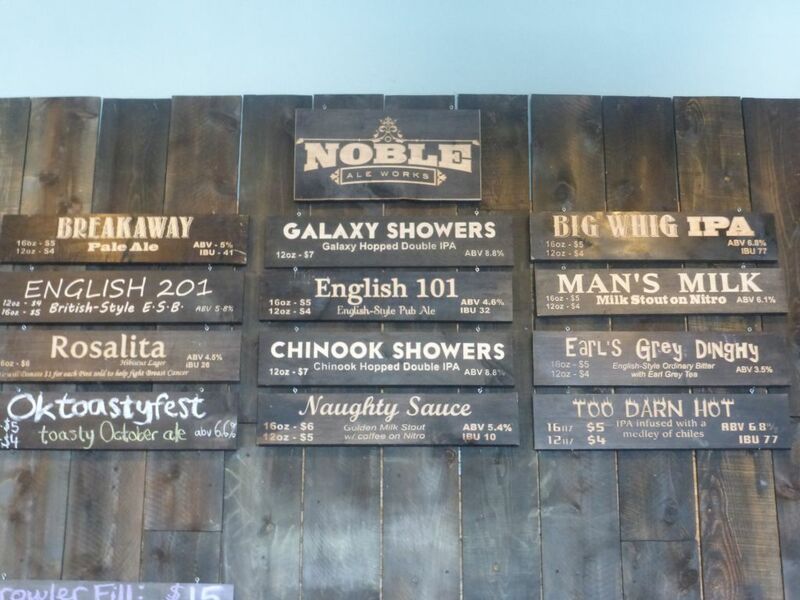 Noble was fairly crowded as well and overall is worth a stop if you like IPAs. If you can’t make it up to the brewery look for their Big Whig IPA on tap at local beer bars. 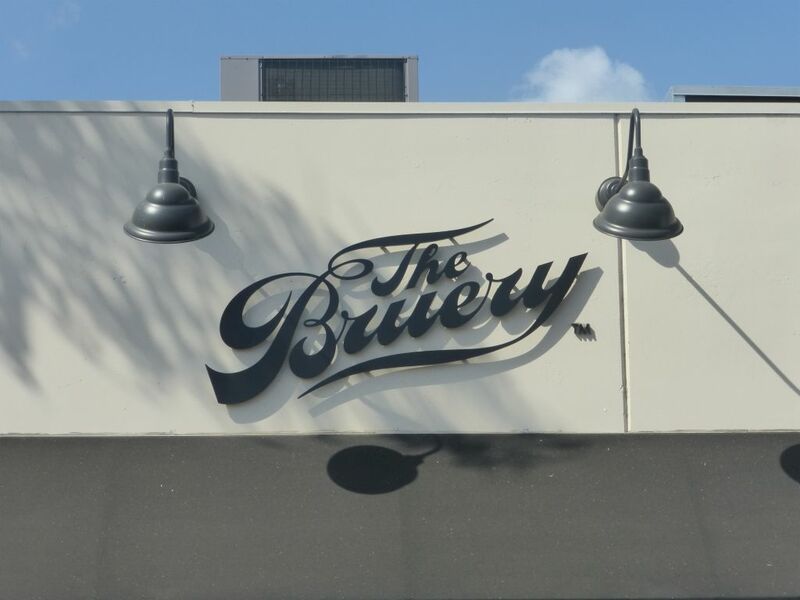 The Bruery has been open for a few years now but I hadn’t heard of it until I went to the Beer Bloggers Conference this year in San Diego. Though they have a few year round beers, when you visit the brewery you can tell that they are really focusing on sour beers and barrel aged imperial stouts. Many of the sours and barrel aged stouts are limited releases and the bottles are a bit more expensive than usual. Though I did taste a few barrel aged beers while I was there, I mostly focused on the core brews that sounded interesting. 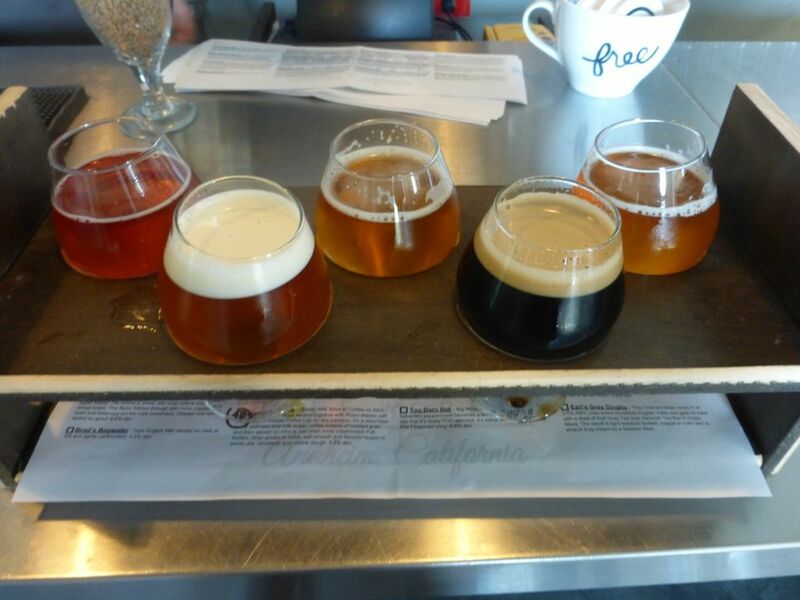 I was heading to Noble Ale Works (only 7 miles away) next so I couldn’t try more than a full five taster flight. A number of the interesting sounding beers were described as hoppy so I hoped that I would find something that would satisfy my hop cravings. In total, I tried the double dry-hopped red, hoppy belgian golden, india pale lager (IPL), dubel with cacao nibs and vanilla, and a bourbon barrel aged stout with cherry and vanilla. The double dry-hopped red ale was interesting for two reasons. First, it didn’t really have much malt flavor to speak of. Second, it was mostly light bodied and taken over by floral hops. Thus, it really tasted more like a floral session IPA than anything else. It was a solid beer but I found the floral hops to be a little too overpowering leaving just a light citrus background. The hoppy Belgian golden was a solid Belgian gold though the hops were very light, mostly serving to balance out the typical spice flavors a Belgian beer makes. The IPL was pretty disappointing overall although I have a hard time pinpointing the specific flavor that I didn’t like. Based on the description on the website, it seems the herbal flavors were a bit overpowering in this one. The dubel was a very tasty chocolate beer and totally different than what I usually get. Rather than a thick full-bodied stout, this was a lighter bodied Belgian beer that displayed the chocolate flavors quite prominently. Finally, the bourbon barrel aged stout with cherry and vanilla was quite nice. The bourbon flavor came through nice and was balanced with a light amount of tart flavor from the cherry. I was generally disappointed by the lack of lower alcohol dark ale offerings. Though they have a bunch of imperial stouts, there is no porter or stout anywhere near the 5% alcohol range. They also didn’t have an IPA, which it seems they were purposefully avoiding. Though many of the beers I tried were described as hoppy, they didn’t really satisfy my cravings. An IPL when done right would take the place of a solid IPA but the IPL here was purposefully avoiding the West Coast style of IPA. By contrast, Ballast Point makes a delicious IPL that I am a huge fan of. 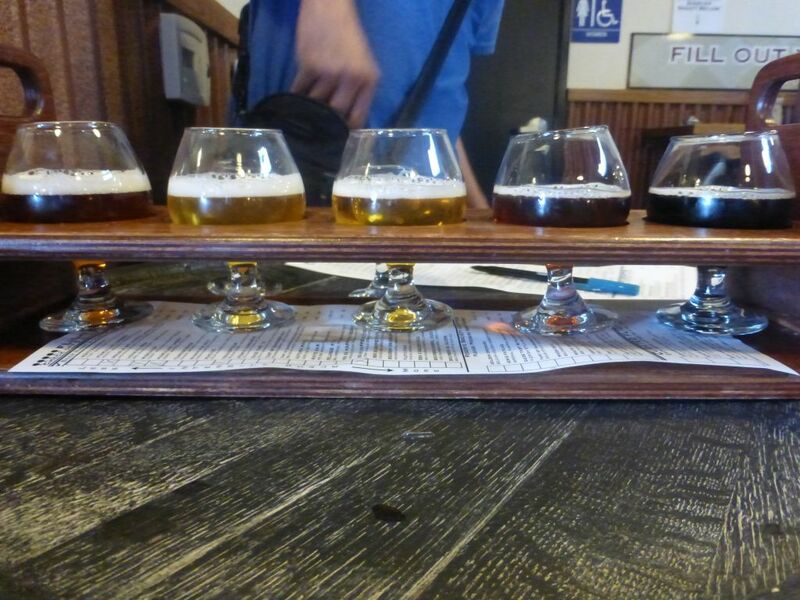 If you like sours, there are a lot of options to try at The Bruery. They also seem to be doing a great job with the barrel aged imperial stouts and special limited release bottles. What they weren’t able to do is satisfy this hop-head’s cravings for the West Coast hop flavors. If you really like floral and herbal hops then you might enjoy their hoppier options a little bit. Otherwise, I suggest you head over to Noble nearby for your hop fix.